Kent first innings 210 (Mike Powell 48*, Daniel Bell-Drummond 42, Imran Tahir 4-31) and second innings 105 without loss (Sam Northeast 54*, Daniel Bell-Drummond 48*) drew vs. South Africans Hashim Amla 77, Jacques Kallis 54, Charlie Shreck 3-90). The two young openers of Kent, Sam Northeast and Daniel Bell-Drummond excelled against the top class bowling of South Africans as the tour match ended in a draw. Kent was bowled out for 210 runs in the first innings and the South Africans responded with 314 before their innings was folded back. The openers of Kent smashed 105 runs in 22 overs in the last session and the duo could not be separated until the end of the final day’s play. The three day tour game was concluded on Sunday, July 15, 2012, at St Lawrence Ground, Canterbury. Earlier, the South Africans initiated day three at 108 for the loss of two wickets in 35 overs. Hashim Amla and Jacques Kallis were at the crease with 36 and 23 respectively. Ivan Thomas and Simon Cook started off the bowling, both bowled accurately and their first four overs ended as a maiden. The 40th over produced six runs with a four from Amla as Kalis dispatched two consecutive fours in the 44th over. Amla completed his fifty in the 46th over as both batsmen started playing their strokes and the ball was going over the rope at regular intervals. Kallis achieved his fifty in the 49th over with three well placed fours and took the score to 180 in 55 overs. Hashim Amla retired hurt for 77 and Jacques Kallis followed him after scoring 54 runs as AB de Villiers and Jacques Rudolph replaced them in the centre. AB de Villiers tried to open his arms and got three fours in no time but lost his wicket for 14 runs as Jean-Paul-Duminy took guards. The batsmen found it hard to score the runs freely and crept to 248 in 83 overs before Duminy tasted his first four in the next over. The score was enhanced to 265 in 86 overs when Duminy was clean bowled by Ivan Thomas for 34. Rudolph carried on with his patient knock as the wickets kept on tumbling from the other end. Jacques Rudolph was the ninth batsman who went back to the pavilion for 50 when he was caught and bowled by Adam Riley. The entire South Africans team was bowled out for 314 runs in 93 overs. Charlie Shreck was the most successful bowler with three wickets, Riley held two whereas Thomas, Matt Coles and Simon Cook shared one wicket each. 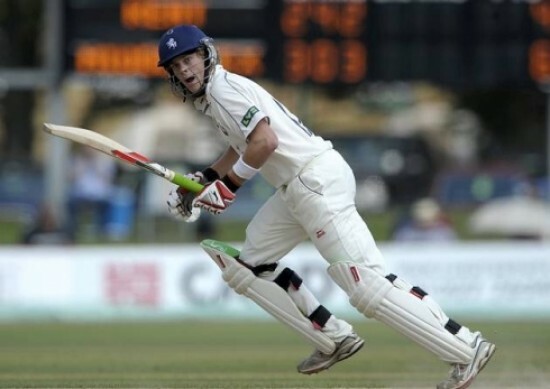 The South Africans took a first innings lead of 104 runs when the 22-year-old Sam Northeast and 18-year-old Daniel Bell-Drummond came out to open the second innings for Kent. The latter scored a boundary in the initial over and the first followed him in the second. They played brisk cricket, the runs were flowing from their blades at will and the first fifty of the innings was posted on board in the 9th over. The South African skipper, Graeme Smith, utilised six bowlers to break the partnership but remained unsuccessful. Northeast was the most aggressive of the two batsmen and hammered his fifty in the 20th over with a four. The game came to an end after the 22nd over when Kent reached 105 runs without losing any wicket, Sam Northeast and Daniel Bell-Drummond were unbeaten for 54 and 48 runs accordingly. The second warm up game ended in a draw and South Africa will face England in the first Test at Kennington Oval, London, commencing from July 19, 2012.